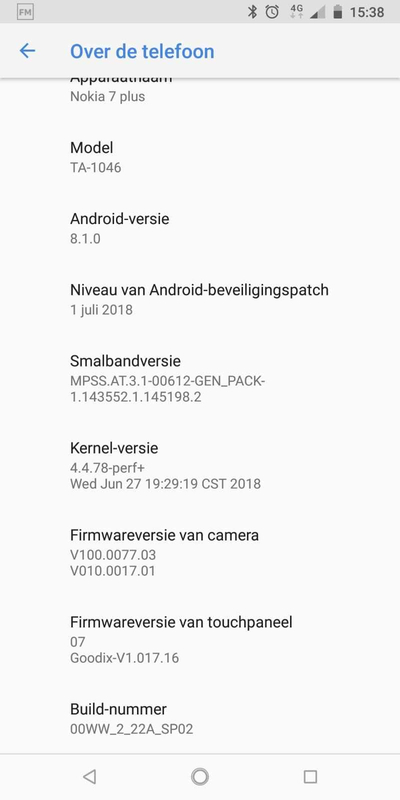 There is a problem with minimal brightness in Nokia 7 Plus. If you have novatek controller it won't get dim below 16% on brightness slider. 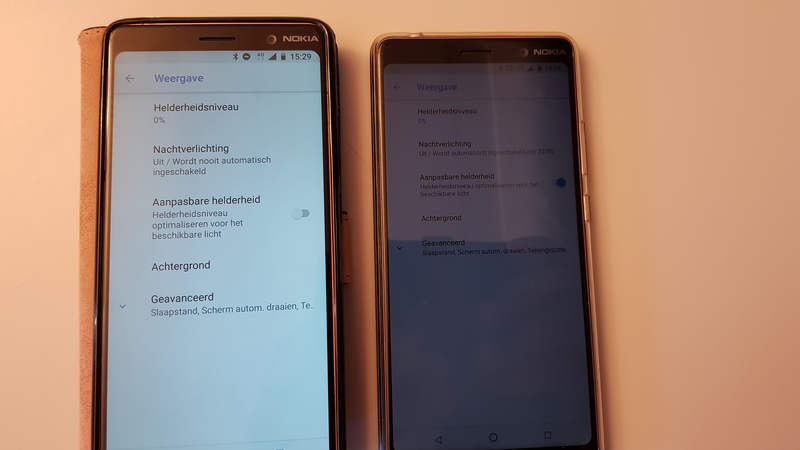 There is a problem with minimal brightness in Nokia 7 Plus. If you have novatek controller it won't get dim below 16% on brightness slider. Here is the comparison, left one is "Novatek-V07" right one is just "07". This makes the device unusable at night. I've send mine for repairs and got it back unrepaired with reason: Fault not found. 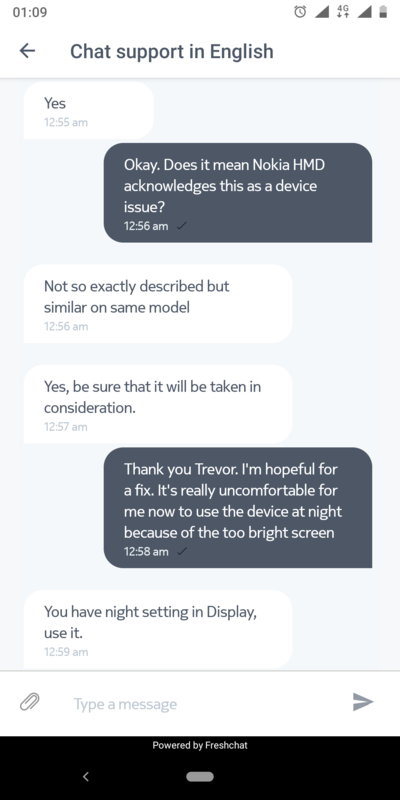 Support is only telling to reset the phone to factory and see if it works then. Nokia, release some firmware update to fix this issue please or accept the phone for repairs. Yup. And also colors look much worse than on the simple 07 firmware. I have the same issues with my phone. Also have touch panel firmware version Novatek-V07. Do we have ways to elevate this problem? I am hopeful for a fix. Very uncomfortable using at night or dark areas. 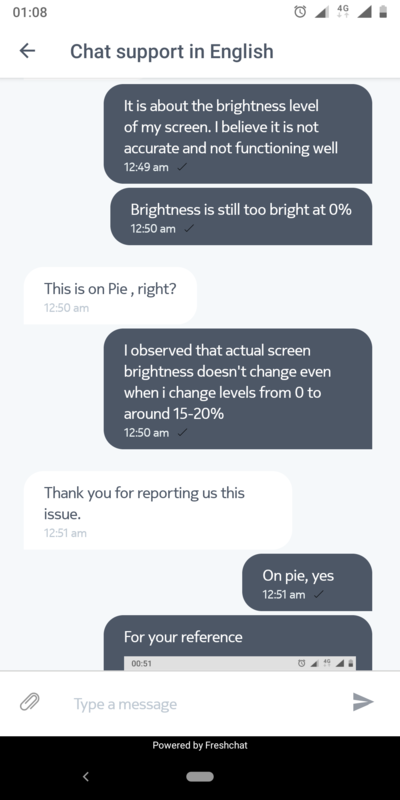 I've talked to support chat regarding this issue. As per the representative I've talked to, it has been now acknowledged as a known issue and they have received similar reports already. I'm also a proud owner of this screen brightness problem. As no firmware update has been released all the time this problem has been known, it appears necessary to indeed replace the Novatek V07 screens? I have the same problem with my Nokia. I have Novatek, sensitivity problems of the touch screen when the phone is lying, brightness that remains blocked at 16%. Please Nokia, give us a simple answer on the possibility of solving the problem: yes or not ? 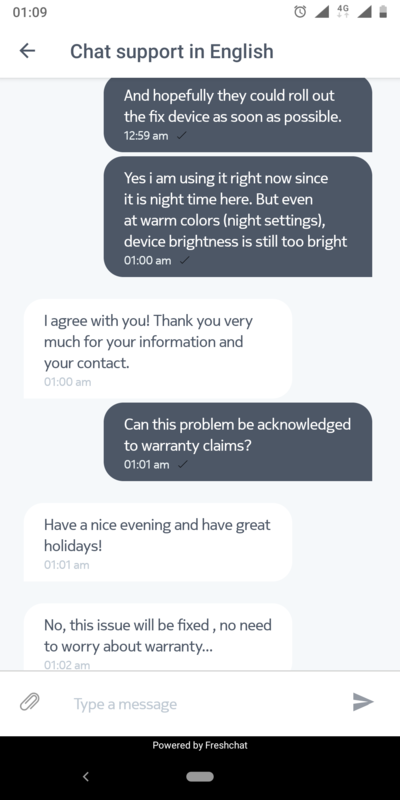 I contacted a French website very famous for its tests and articles in the world of technology to tell them about the problem. They had previously rated the Nokia 7 plus and gave it a very good rating for the quality of the screen. I advise you all depending on your country to contact your smarphone test reporters so they can communicate about the problem. Same here. Nokia has not yet fixed this problem. If this is software issue, it should be fixed immediately. If it is hardware issue, Nokia should provide free repair to its customers. Guys is there a way to bring this to Nokia Attention! This is definitely a software issue. With an app called Dimly you can dim the screen to 0% of brightness. I think you're actually make pixels more black (or totally black) but backlight is the same. Any updates? Is it ever getting fixed? Actualky, are we even sure that it's a software bug? There's an app on XDA which reduces brightness below stock minimum. I used to use it when I owned other phone. But I don't remember if you need root or not for it to work. My guess is that those LEDs used for backlight are bad quality and probably they misbehave if they set it to lower brightnes. Maybe there is some flickering effect or something. I don't have any hopes they can fix that. I only hope I'm wrong whit this theory. 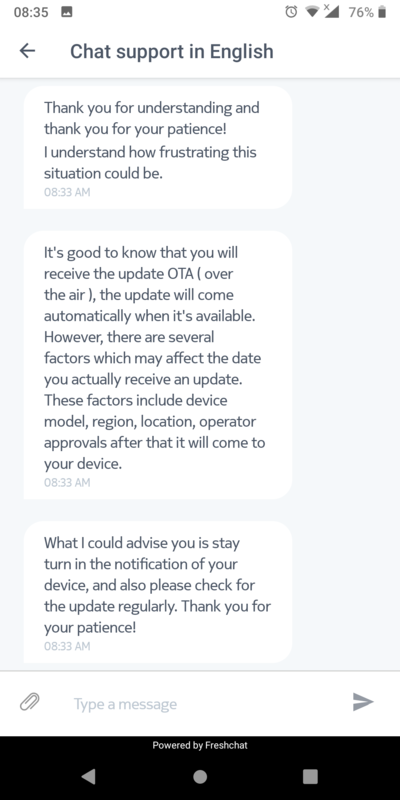 I talked to the support today and they said that this is a common issue and there will be an update to adress this issue. It has been longtime when this problem was reported and now its being 8 months still no software fix from Nokia. 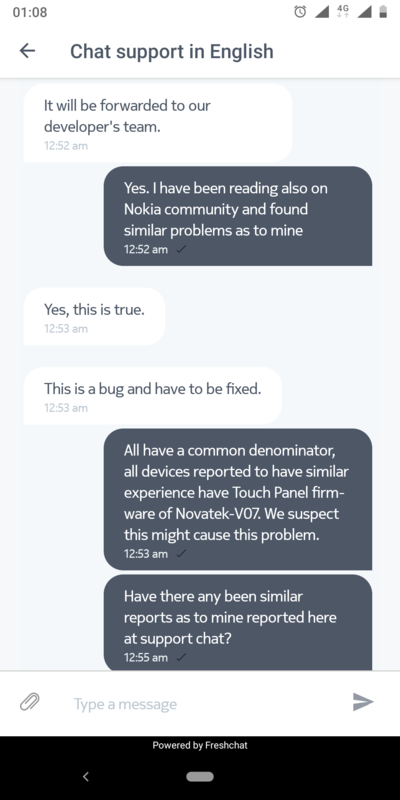 I believe it is because of bad hardware (Novatek-V07 Panel) and Nokia's Authorized Repair Centers are not fixing it under warranty. This would be my last Nokia Device and i will never recommend Nokia to any to my Friends and Family member. 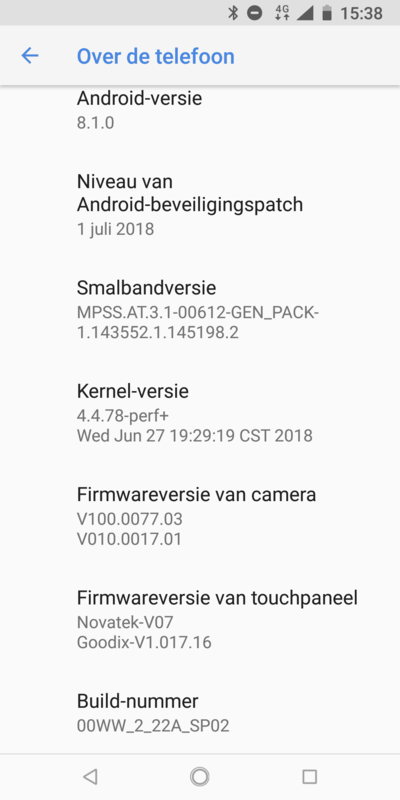 I have unlocked the bootloader and flash GSI ROM from XDA even changed the Kernel to verify if it is a software issue or a hardware issue but nothing solved. It is confirmed that this is a hardware issue. Nokia has produced more than 50% units with faulty display (Novatek-V07) and that is the reason Nokia is not admitting this issue because each replacement will cost USD 150-180 and Nokia is not brave enough to do so. faulty display?! more apps worked perfect 0-20%!! Anyone got an update on this issue? Just bought the phone not realising this could be an issue.. and guess what... it has novatek screen. No .. there's no fix and there will never be .. i can guarantee you that .. Every Novatek-V07 is faulty .. It's a hardware problem .. And the support team is like retarded or something .. This phone is totally garbage .. So many problems and everytime i try to speak to the support they act like they don't know what i am talking about and they can barely mumble some english sentences .. Except this problem this phone is trash as i said .. The USB-C port's quality is so low that at the slightest move of the phone when it is charging it looses contact .. VoLTE is not even working .. I have this phone since last summer .. My carrier plan includes VoLTE but it just doesn't work .. Widevine CDM on my 7 Plus is L3 so no HD Netflix .. and so on .. THIS PHONE IS TRASH. I also have a Novatek-V07 display with the same issue.. and with wifi issue...both issues could be fixed with a MR software update but Nokia is still ignoring our requests from many months!! Why?? There are a lot of hardware problems and those cannot be fixed by software updates. Novatek-V07 is one of them. I have sold my Nokia 7 Plus and will never buy Nokia Phone again in my life. Well, I always had premium smartphone from LG or Samsung, also HTC but I always had software and hardware issues. Every big brand with top quality phones can have hardware issues, I experienced boot looping on My LG G4, bad motherboard on Samsung S3 etc...I think this can happens, even if this is a very bad thing. The difference between a brand and another is HOW they manage these problems with customers and their time to solve/fix errorors. While for an hardware problem I can wait couple of weeks for repair the device, I absolutely can't stand for a software issue to wait MONTHS for a patch!! This seems like a conductive issue. I've had this phone for a week brand new on contract and also experiencing the same issues. It's actually quite difficult to use the keyboard because of the touch screen issues, close to becoming an unusable and non recommended device. When I lay this phone on fabric the screen is fully unresponsive but when I hold it it's partially usable. I have to grip the phone tight to be able to use the screen properly. Did they mention in what century that will happen?